Style is a personal work of art unique to every human. No matter where you are in the world, your style is a reflection of your personality. That little cat pin on your collar or your short lace skirt is a little giveaway to your inner style – little clues to all those who pass you by. Who said that having crazy outfits is only allowed during Halloween or at some festival? Color your daily life with these unusual style choices you can (and should) actually wear. 1. Ombre everything. Yes, it is not just a hair trend any more. Formally known as ‘shading’ it is a subtle transition from light to dark, and it is taking over the fashion industry. 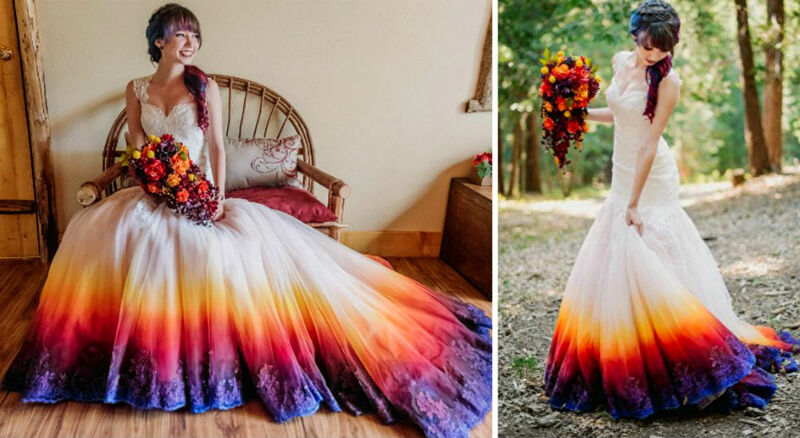 Just take a look at this stunning ombre wedding dress. Who wouldn’t want to say ‘I do’ to this? You can order one to get dyed here. 2. These ombre tights made by Tiffany Ju are simply amazing too! Fall is already here, and what better way to stay warm in cold weather than with these colorful hand-dyed tights. Lucky for you, there are different varieties available on Etsy.